Nandi Mehta turns in the midfield. 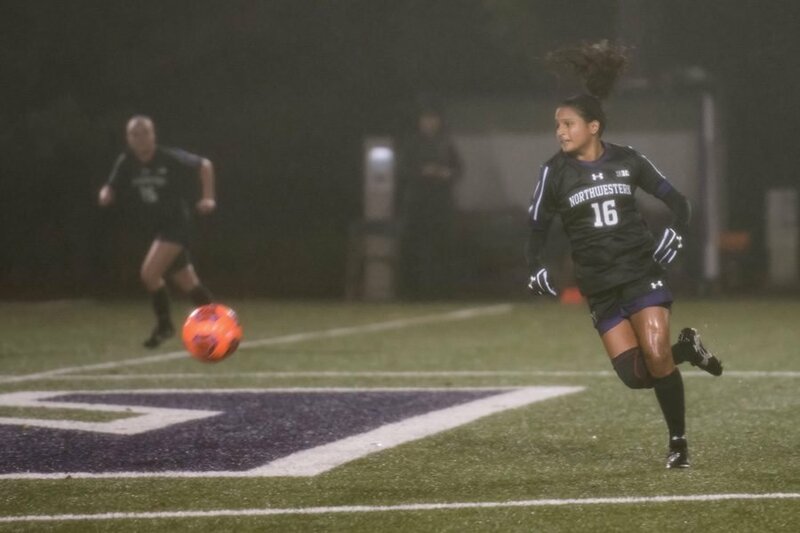 The graduate midfielder and Northwestern will look to begin its NCAA Tournament run with a win Saturday against Kent State. No. 21 Northwestern will host an NCAA Tournament game at Martin Stadium for the first time in the program’s history on Saturday. To advance, the Wildcats (14-2-4, 7-1-3) will have to take down a Kent State (15-2-2, 8-1-2 MAC) team making its first NCAAs appearance. Junior goalkeeper Lauren Clem said she’s excited to start off the playoffs on a field where the Cats have not lost all season. This season, Clem, the Big Ten Goalkeeper of the Year, and NU’s defense have thrived at home, allowing one goal in 11 in Evanston. And regardless of where they’ve played, the Cats have consistently had one of the stingiest defenses in the country, allowing six goals all season and one in their last six games. Although it’s clear NU’s defensive unit is as strong as ever, the Cats will need to come prepared against a Kent State offense that puts up 2.36 goals per game. The Golden Flashes powered their way to an MAC conference tournament championship en route to the NCAAs, winning three games by a combined score of 6-1. NU’s defense has propelled it to many victories this season, but the Cats’ offensive success will ultimately determine their fate. NU has scored just one goal in its last five games, and been sporadic on offense all year. Although both teams have lofty records, NU has faced more tests throughout its conference schedule than Kent State. The Big Ten sent eight teams to NCAAs, the most of any conference, and Kent State is the only team in the MAC that received a berth. The only time the Golden Flashes played a Big Ten team this season was Aug. 19, when Kent State lost 3-0 to Ohio State, a team the Cats tied Oct. 1. For NU, this will be a return to the NCAAs after a second-round loss last year. It is only the fourth tournament appearance in the Cats’ history, and they have never made it past the round of 16. NU beat expectations to get to this point, and coach Michael Moynihan said the Cats have surprised this year by playing with a special kind of energy. NU will have its fair share of challenges ahead if it can get past Kent State. If the Cats win, NU will likely take on No. 11 Notre Dame in the second round. In addition, No. 1 West Virginia is in the Cats’ region of the bracket, and NU could have to face the Mountaineers if it advances to the quarterfinals. The Cats went down 4-0 to West Virginia in the second round of the NCAAs last year. Looking forward to the tournament, sophomore defender Hannah Davison made it very clear that the team has a matchup with the Mountaineers on their mind.